Your shoulder is the most flexible joint in your body. It allows you to place and rotate your arm in many positions in front, above, to the side and behind your body. This flexibility also makes your shoulder susceptible to instability and injury. It is important you understand how your shoulder woks and the common causes of shoulder problems, the available treatment options and exercise, and activities to enable you to regain pain free use of your shoulder. Depending on the nature of the problem, conservative nonoperative methods of treatment often are recommended before shoulder arthroscopy. However, in some instances, delaying the surgical repair of a shoulder can increase the likelihood that the problem will be more difficult to treat later. Early, correct diagnosis and treatment of shoulder problems can make a significant difference in the long run. The shoulder is a ball and socket joint. It is made up of three bones; the upper arm bone (humerus), shoulder blade (scapula) and collarbone (clavicle). The ball at the top end of the arm bone fits into the small socket (glenoid) of the shoulder blade to form the shoulder joint (glenohumeral joint). 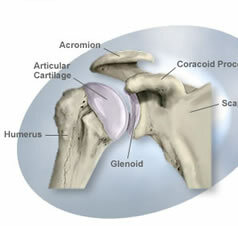 The socket of the glenoid is surrounded by soft tissue rim (labrum). A smooth, durable surface (articular cartilage) on the head of the arm bone, and thin inner lining (synovium) of the joint allows the smooth motion of the shoulder joint. The upper part of the shoulder blade (acromion) projects over the shoulder joint. One end of the collarbone is joined with the shoulder blade by the acromioclavicular (AC) joint; the other end of the collar bone is joined with the breastbone (sternum) by the sternoclavicular joint. The joint capsule is thin sheet of fibers that surrounds the shoulder joint. The capsule allows a wide range of motion yet provides stability. The rotator cuff is a group of muscles and tendons that attach your upper arm to your shoulder blade. The rotator cuff covers the shoulder joint and joint capsule. .The muscles attached to the rotator cuff enable you to lift your arm, reach overhead, and take part in activities such as throwing or swimming. Bursitis or Tendonitis can occur with overuse form repetitive activities such as swimming, painting or weight lifting. Theses activities cause rubbing or squeezing (impingement) of the rotator cuff under the acromion and in the acromioclavicular joint. Initially, these problems are treated by modifying the activity which causes the symptoms of pain and with a rehabilitation program for the shoulder. Partial thickness rotator cuff tears can be associated with chronic inflammation and the development of spurs on the underside of the acromion or the AC joint. The conservative nonoperative treatment is modification of activity, light exercise and occasionally, a cortisone injection. Nonoperative treatment is successful in the majority of cases, but if it is not successful, surgery often is needed to remove the spurs on the underside of the acromion and to repair the rotator cuff. Full Thickness Rotator Cuff Tears are most often the result of impingement, partial thickness rotator cuff tears, heavy lifting or of falls. Nonoperative treatment with modification of activity is successful in the majority of cases. If you continue to have pain, surgery may be needed. Surgery may be necessary to repair full thickness rotator cuff tears. Arthroscopic techniques allow shaving of spurs, evaluation of the rotator cuff and repair of some tears. Both techniques require extensive rehabilitation to restore the function of the shoulder. The two basic forms of shoulder instability are subluxations and dislocations. A subluxation is a partial or incomplete dislocation. If your shoulder is partially out of the shoulder socket, it eventually may dislocate. Even a minor injury may push the arm bone out of its socket. A dislocation is when the head of the arm bone slips out of the shoulder socket. Some patients have chronic instability-shoulder dislocations occur repeatedly. Fractured Collarbone and AC Joint Separation are common injuries of children and others who fall on the side of their shoulder when playing. Most of these injuries are treated nonoperatively with slings or splints. Severe displaced fractures or AC joint separation may require surgical repair. Fractured Head of the Arm Bone is a common result of falls on an outstretched arm, particularly by older people with osteoporosis. If fragmented or displaced, it may require open surgical repair and possibly replacement with an artificial joint (prosthesis). Osteoarthritis and Rheumatoid Arthritis can cause destruction of the shoulder joint and surrounding tissue, as well as degeneration and tearing of the capsule or the rotator cuff. Osteoarthritis occurs when the articular surface of the joint wears thin. Rheumatoid arthritis is associated with chronic inflammation of the synovium lining which can produce chemicals that eventually destroy the inner lining of the joint, including the articular surface. Shoulder replacement is recommended for patients with painful shoulders and limited motion. The treatment options are either replacement of the head of the bone or replacement of the entire socket. Your orthopaedic surgeon will discuss with you the best option. A medical history to gather information about current complaints; duration of symptoms, pain and limitations; injuries; and past treatment with medications or surgery. A physical examination to assess swelling, tenderness, range of motion, strength or weakness, instability and /or deformity of the shoulder. Diagnostic tests such as x-rays taken with the shoulder in various positions. An MRI (Magnetic Resonance Imaging) may be helpful in assessing soft tissues in the shoulder. A CT (Computerized Tomography) scan may be used to evaluate the bony parts of your shoulder. Your orthopaedic surgeon will review the results of your evaluation with you and discuss the best treatment. You and your doctor may agree that surgery is the best treatment option. He will explain the potential risks and complication that may occur. Your doctor may discuss donation your own blood to the used if needed during surgery. No food or drink after midnight before surgery. An hour before surgery, you will be assessed in the preoperative area by a nurse anesthetist or anesthesiologist. A general anesthetic will be given so that you sleep throughout the entire procedure, or you will remain awake after receiving an injection which prevents you from feeling pain. Arthroscopy allows the orthopaedic surgeon to insert a pencil- thin device with a small lens and lighting system into tiny incisions to look inside the joint. The images inside the joint are relayed to a TV monitor, allowing the doctor to make a diagnosis. Other surgical instruments can be inserted to make repairs, based on what is visualized and diagnosed with arthroscope. Arthroscopy often can be done on an outpatient basis. Open Surgery may be necessary and, in some cases, associated with better results than arthroscopy; open surgery often can be done through small incisions of just a few inches. During surgery, your orthopaedist can tighten a torn or stretched capsule, reattach a torn labrum, and repair other damage to your shoulder joint. Tightening or repairing the capsule and the labeum can be done using one of the techniques described above. If the capsule is stretched, your orthopaedist may use surgical thread (sutures) to tighten it. Your doctor folds the excess capsule underneath itself and stitches it together. If the capsule and labrum are torn, your doctor can use sutures to reattach them to the glenoid. Instead of putting sutures directly through the glenoid, your orthopaedist may use surgical anchors. Surgical anchors are inserted into small holes drilled in the glenoid. Sutures connected to the top of the anchors are used to reattach the capsule and labrum. Depending on the procedure, you may go home the same day or spend one or two days in the hospital. Before you go home, you'll be given instruction about how to care for your shoulder while it's healing. Your shoulder will heal best if you follow these instructions. After the procedure, your shoulder is covered with a sterile dressing and your arm is immobilized in a sling or brace. Pain medication and cold packs can help make you joint comfortable during the first few hours after surgery. You won't be able to use your arm, so arrange for someone to drive you home. Once you are at your hotel keep your dressing dry and clean. Don't remove your sling or brace or try to use your arm until your doctor says it's okay. In the days following the surgery you may visit your orthopaedist or be visited by him or a nurse to have your dressing checked and to schedule when your stitches will be removed. There are always some risks with any surgery, even arthroscopic procedures. These include possible infection and damage to surrounding nerves and blood vessels. However, modern surgical techniques and close monitoring have significantly minimized the occurrence of these problems. Be sure to call your doctor if you develop any of these symptoms after surgery. Numbness or tingling of the arm or hand. It's important that you continue a shoulder exercise program with daily stretching and strengthening. In general, patients who faithfully comply with the therapies and exercises prescribed by their orthopaedic surgeon and physical therapist will have the best medical outcome after surgery.